Q. How can I get additional plots to grow more grapes? A. As you level up you will be given the option to plow additional plots. 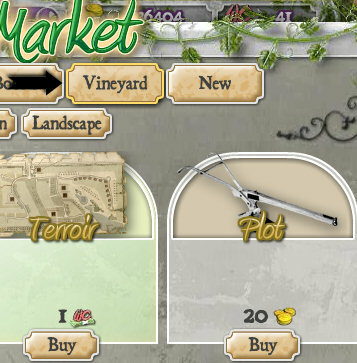 Obtain these plots through opening the Market and clicking on the Vineyard tab. It costs 20 coins to plow a new plot. Once you have clicked on the plot in the Market, the Market window will close and you can click on the ground in any grassy area where you want to place the plot. NOTE: Currently the maximum number of plots you can have is 70 and that is at level 60, which is the highest level to be attained … so far. Q. Can I move plots? A. You cannot move plots, but you can delete them with the Delete Tool and re-plow them in a new location. Q. How do I plow so I can plant a new crop? I don't have a shovel! Q. 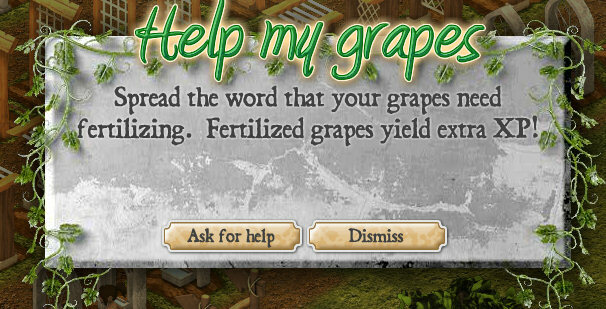 Why don't I get any coins when I harvest my grapes? A. Coins are not collected upon harvesting grapes. They are earned: AFTER you have stomped the harvested grapes and either: Sell the juice immediately - OR - Sell the Wine you have chosen to age. Again: You do NOT collect coins for harvesting grapes. You must do something with the grapes, i.e. crush and sell the juice/wine to get coins. Q. How long do I have to harvest my grapes after they are ready? Will they wither and die? A. Your grapes will NOT die on the vine or on the crush pad. They will remain the same until you harvest them or crush them. Q. Which grape should I plant? A. The answer depends on your immediate goals. If your aim is to level quickly, then you should plant the grapes with the highest experience per hour. Chardonnay, Merlot, Pinot Noir, Viognier, Muscat, Marsanne, and Nebbiolo are all good choices. Note that experience is gained when the grapes are planted, not when they are harvested. If your aim is maximum profitability, then you should plant grapes with high profit per hour. Zinfandel, Roussane, and Nebbiolo are good choices. Note that when presented the choice between grapes which provide the same profit per hour, it is generally advisable to choose the grape which matures quickest because more barrels can be made more quickly. Barrels add value to the wine, and therefore increase overall profitability. For example, Muscato and Grenache have the same profitability, but Muscato ages three times as quickly, meaning it provides the opportunity to add value to the wine thrice while Grenache can only be barreled once in the same time period. If a player does not log in often, however, it may be more advisable to plant the grapes which mature more slowly, as these will make more efficient use of time while the player is logged off. Q. Can I mix different grapes together? Q. What does O.V. and A.V. mean on some of the grapes such as A.V. Chardonnay? "Some say a vine is old when it reaches 25 years old, but others say 35, Chandler said. At 75, a vine is considered a "heritage" vine, and at 100, vines are referred to as ancient…"
http://www.lodinews.com/articles/2005/06/21/news/1_vines_050621.txt (Thanks to Glenn McGuire for that information). Q. Where did the fruit go when I harvested my trees? I cannot find it. A. When you harvest the fruit from your trees (i.e. Apple, Olive) the fruit is sold automatically and you receive the coins. Watch your coin balance as you harvest and you will see it increase. Q. I can't find the barrels in the Market. How can I get one to put my wine into? Q. Does the value of my aged barrel of wine continue to go up if I let it age longer? A. The value of your aging wine will increase until it is "fully aged and ready to sell." The value will be increased even more by having peole taste the wine as it ages. (Having more tasters gives your wine a higher rating upon sale which results in a higher final value) But once the barrel is fully aged, it will no longer appreciate in value, even if you allow it to sit longer and have more tasters. The only reason to allow a wine to sit after it is fully aged and ready to sell is to give your friends an opportunity to taste it which helps them out with earning coins and experience points. Q. What are "boosts" and how do I use them? A. Boosts can be applied to a barrel of wine that is either aging or is fully aged, before you sell it. It can affect the speed of aging, the score of the final product, the yield, etc. More information on specific boosts can be found on the items page. To apply a boost, go into your Gift Box to use one received from a friend, or open the Market to buy one. Once you have clicked on the boost you want to use, that window will close and you can then click on the exact barrel to which you want to apply your boost. You will get a confirmation pop up of the change that will be caused by the boost application. Q. How can I expand my vineyard to make it bigger? A. Open the Market and click on Vineyard. 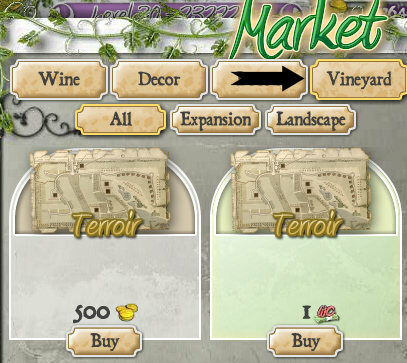 Purchase Terroir and click on your vineyard edges to clear trees and expand your land. There is at this time a known issue with Terroir expansion. See below in the section for "Known Bugs." Q. Can I move the water or cobblestones and other ground cover features if I don't like it after I've placed it? A. You CANNOT move grass, water or paving cover after you have placed it on the foundational terrain. However, if you don't like the results, you can cover it over with something different. Q. How can I move the crush pad and juice storage tank? A. You cannot move these items. They are placed permanently and you must work around them. Q. I have seen a decorative barrel which lays down in some vineyards, but I do not have one. Where can I get one? A. 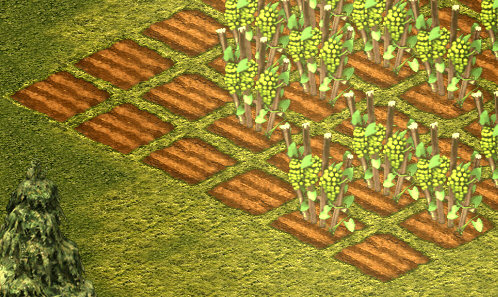 This was a feature that was included with early vineyards, but was not included with new vineyards after the first couple of weeks of the game being released. At this time, there is no way for you to obtain it. Q. How can I change my avatar, name or picture? Update: 8/15/2010 You can change your avatar a bit. At the bottom of the screen, your gift box now has 4 levels, your gifts, your storage, your awards, and your avatar. click on your avatar it will give you a male and female choice and then you can pick from a selection of avatars within each of the two genders. Q How can I earn Wine Cash? A Wine Cash is the "other" currency in the game used to buy selected items. Wine Cash can be earned through earning achievements, being awarded them from the wishing well, and for making the perfect wine blend. You can also buy it or acquire it by completing special offers found on the "Buy Wine Cash" tab at the top of the game screen. Q. I have leveled up several times but I have not gotten any Wine Cash. Why? A. Wine Cash is not awarded for leveling up. See previous question. NOTE 5/14/10: It seems the developers may be experimenting with awarding Wine Cash for leveling, but it is not yet clear whether they are going to fully implement it. Some players have received Wine Cash recently for leveling up and also for logging in and visiting other vineyards. None of these Wine Cash awards were consistent, so it seems to be a part of the ongoing beta testing of the game. Q.What Comes in a Mystery Box? Q. What are Truffles? What do they look like? What do they do? A. Truffles are a kind of mushroom. They pop up randomly when you visit a neighbor and sometimes when you are at home in your own vineyard. Clicking them will give you random coins and experience points. There are three kinds to find: White, Red and Brown. Q. How can I see more of my vineyard on the screen? Q. How do I make money in this game? A. You make money in several different ways. Sell the juice or wine you have made. Selling fully aged wine in the best available barrel using grapes with a high yield makes the most profit. Selling juice immediately after it is crushed makes a small profit. Helping Neighbors - you get coins and xp for all the following activities. Help build a neighbor's house. Q. Can I visit the vineyard of someone who is not my neighbor? A. Yes. You do not have to be Facebook friends with or a neighbor of someone to visit their vineyard. All you need is an active link that will take you to it. See below for instruction on publishing a link to a vineyard. If you have a link which is created in that way, you can visit the vineyard at that link any time. Q. How many points does it take to get to the next level? A. The exact number of points needed to advance to the next level is not a feature of the game at this time. Hopefully this is an enhancement being worked on to implement in the future. What you can know is that currently the maximum level which can be attained is 40. Watching the progress of the purple color in your XP (Experience Points) Bar will show you approximately where you are in any given level. Q. I have lost an item. How do I find it? A. Some players have reported "losing" items from their vineyards. If you have lost something like a house or tractor, it is most likely in the trees around the perimeter and reloading your game may reveal it. You may have to try this several times. If you have lost a barrel of wine, try moving around your other barrels or other objects and see if it landed behind something else. This has happened. In one case a player had to log out of Facebook and back in and then their barrel was found. UPDATE 5/17/10 See Finding Hidden Objects for help with this problem. Q. How do I post a link to my vineyard? A. 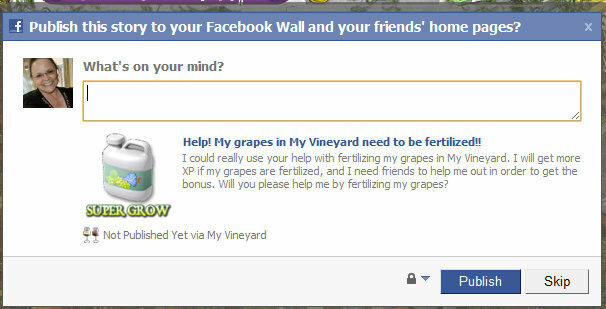 Publish any news from your vineyard as a post to your Facebook Profile Wall. (e.g. : Requests for tasting your wine; Requests for help to build your house; Requests for fertilization of your grapes) Once it is published click the link on the post which will open your vineyard. In the page which loads your vineyard, the address in the bar at the top of your browser window will be the link to visit your vineyard. Copy that and paste it where you want it posted. NOTE: You must open your vineyard by clicking the link on the published post to obtain the correct address link. You cannot use the address generated when you open your vineyard by using the bookmark to your vineyard. Q. How can I remove someone as a neighbor? A. At this time, there does not seem to be a way to remove a neighbor, even if you have deleted them as a facebook friend. Many people have expressed the wish to remove neighbors who are no longer active or whom they have "unfriended" on facebook, but there does not seem to be a way to do this. Suggest you contact the game developer and request for it to be added. Q. How do I upload a picture of my vineyard to facebook? Make sure what you want in the picture is what is on your screen. This can be done in full screen mode or not. Take a picture of your screen. In Windows simply hit the "PrtScn" key (above the "Insert" key on your keyboard). This functions like Edit/Copy. Open a program like Paint or another photo editing program. 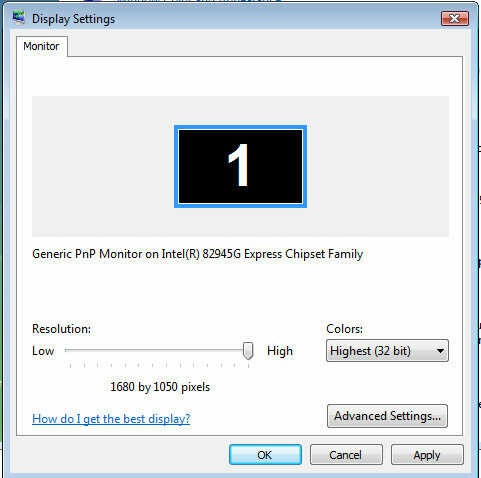 Paste the copied image into the program (Edit/Paste - OR Ctrl+V). Crop the newly created image to your desired result. Save the image as a file format .jpg. This is usually the default.